My spouse and I have moved from the wild, untamed north of Canada, back to regular wild, untamed Canada. Well... Toronto. Well, I have officially done it, I have purchased the car I have hunted for about 16 months. I picked up one of the Atlas Series last year. Great watch, and they are very well priced. My desk. No excuses, it's just a mess. ... Looking at old German Luxury cars, like everyone else on here. One of These would be So Pimp. 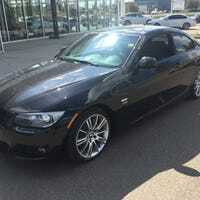 Someone Go To Ottawa (Or, if you live there) And Buy This M3! It's a long weekend (for some of you)! What are your automotive plans? It was most of Canada's long weekend last weekend (Victoria Day was Monday). It is the US long weekend with Memorial Day next Monday, so I wonder what your automotive plans for the weekend are? Personally, I am halfway through replacing the clutch in the SRT-4! This weekend will hopefully be back together! Ok, so I have been thinking about this topic for a while. With their relative used prices reaching more attainable levels, I have been thinking about which one of ze Germans would be the best all rounder. In related news, I can now post on Oppo. Rejoice, today is a day of days of days! Mostly I ordered maintenance things, like a new clutch, bearing, water pump... ect. BUT I also got me some shiny new BC coilovers on their way! Testing... Testing... One Day... Sigh..